Star Trek board game, 1966. With these words – first heard on television sets across North America on September 8, 1966 - science-fiction would journey into new and unchartered territory with a TV series called Star Trek. Following the adventures of the starship U.S.S. Enterprise and its altruistic crew - led by the heroic Captain James T. Kirk (William Shatner), the cool and logical-minded Vulcan First Officer Mr. Spock (Leonard Nimoy) and the cantankerous yet compassion Chief Medical Officer, Dr. Leonard McCoy (DeForest Kelley), Star Trek depicted a 23rd century universe where humans and alien beings co-existed and worked together while endorsing values such as justice, racial tolerance and peace. Tracer Gun Ammo Discs, 1966. Created by Gene Roddenberry, a writer and producer who worked on a number of 1950’s and ’60’s westerns and dramas such as Have Gun - Will Travel and Highway Patrol, Star Trek was pitched to the NBC television network as a cross between a Horatio Hornblower-like adventure and a western set in outer space. Although he sold the concept as a “Wagon Train to the Stars,” Roddenberry actually wanted the series to be more of a morality tale, and insisted on investing it with a social awareness the average western or adventure program lacked. As a result, the conflicts and dilemmas featured in Star Trek would, at times represent allegories and parallels for issues of the day like the Vietnam War, racial and religious segregation, human rights, sexism and misuse of political power. By presenting such issues in a science-fiction milieu, Roddenberry found he could get past the watchful eye of the network – who was concerned about not putting out product deemed controversial or politically-charged. But the basis for what is now a media franchise with six spin off television series (including a 1973-74 animated series) and eleven feature films (including this year’s new big budget release) almost never got off the ground. The series’ original pilot episode, entitled The Cage – featuring not William Shatner as Captain Kirk, but actor Jeffery Hunter as Captain Christopher Pike - was rejected by network executives as being “too cerebral.” Also finding fault with was the strong female second-in-command character, Number One (Majel Barrett – who would later become Roddenberry’s real-life wife) and the character of Spock – who they deemed as being “too satanic looking.” Giving Roddenberry another chance, the network commissioned a second pilot which contained a number of changes such as the addition of Shatner, the deletion of the Number One character and a redesign of Nimoy’s Spock makeup. U.S.S. Enterprise with launcher, 1977. When Star Trek first hit the airwaves, there was no indication of the success it was to later become. In fact, ratings were low and there was talk by NBC about cancelling the series at the end of the first season. Intervention – in the form of a letter writing campaign to the network by loyal fans, as well as support from Lucille Ball, who was head of Desilu Productions (which produced the show from 1966-67) helped the show last for two more seasons where it was cancelled in 1969 after 79 episodes. With enough episodes completed to be eligible to go into syndication, the series would soon became wildly popular in reruns - earning a huge cult following that resulted in fan conventions and the creation of a multitude of merchandise. 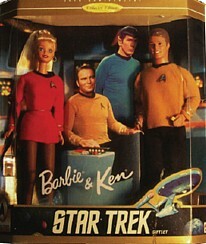 Although Star Trek’s initial audience was comprised of a largely 16 to 39 age demographic, the allure of the show’s otherworldly aliens and elaborate weapons, props and spacecraft were also a natural draw for children and before the series finished its initial run in September of 1969, a number of products including model kits, comic books, board games, activity books and plastic guns were produced. Original Star Trek toys and playthings are among some of the most fondly remembered sci-fi collectibles ever created and now with the release of the new J. J. Abrams-directed motion picture starring Chris Pine as Kirk and Zachary Quinto as Spock, the popularity of, and desire to own vintage Star Trek toys and collectibles has increased considerably. Star Trek The Motion Picture trading cards, Topps, 1979. It’s worthy to note that as far as it is know, there were no Star Trek toys or paraphernalia produced during its first season on the air and all items carry a release date of 1967 or later. 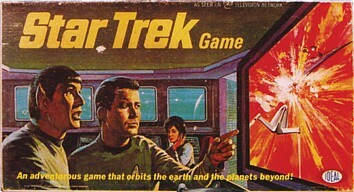 Among the first wave of Star Trek-themed items was a board game - released by the Ideal Toy Company in 1967 and featuring beautiful illustrated graphics of Kirk, Spock and Communications Officer Lt. Uhura reacting to colliding spacecraft on the Enterprise’s viewing screen contained "Spaceship Tokens" and the object of the game was to move your “spaceship” from Earth (positioned in the center of the game board) to three planets listed on a “Mission Destination Card,” then back again to Earth before your opponents can. The toy is significant because it is the only board game known to be released during the original run of the series. U.S.S. 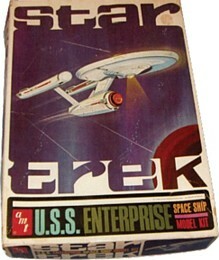 Enterprise model kit with lights, 1966. Aluminum Metal Toys, or AMT - known for their extensive line of model kits of cars and trucks obtained the exclusive rights to make Star Trek plastic model kits during this time (a relationship that lasted for many years) and released a model kit of the U.S.S. Enterprise in 1967. The original version of the kit was equipped with several battery-operated lights. By the following year, a Klingon Battle Cruiser was added, as was a figural kit of Mr. Spock - battling against a three-headed alien creature. By the late mid-1970’s, other kits were added to the list, including models spacecraft like the Romulan Bird of Prey, the Galileo shuttlecraft, K-7 Space Station and a diorama-inspired Enterprise Command Bridge (complete with miniature figure of Spock and a seated Kirk at his chair). 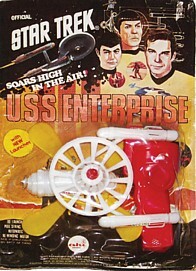 Many of the kits were best-sellers and continued to be reissued for years – though the battery-operated light feature in the Enterprise would later be discarded. Remco (which would later be bought by Azrak-Hamway International (AHI)) released several Star Trek related items in 1967. 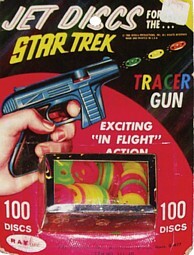 A “Tracer Gun” – a rather generic looking “ray gun” which shot small plastic discs was released, as was a “Tracer Scope” gun – which curiously resembled a sawed off riffle and could shoot the same aforementioned discs. Remco would later go onto produce an extremely nice plastic Utility Belt Set – complete with the Disc Shooting Phaser Gun and discs, Communicator and Tricorder a few years later. Despite the lack of creativity of the early guns, the packaging featured very nice graphics and the toys are now very much sought after by collectors. Mr. Spock, rare Star Trek II: The Wrath of Khan cardboard standee, 1982. Other items included a set of 72 trading cards (featuring crisp, black and white photos and images) released by Leaf in 1967 as well as a Mr. Spock children’s Halloween costume produced by Ben Cooper (also released that year). Ultra rare because of its limited production run, it can fetch close to a couple of hundred dollars in mint condition complete with mask and box. Additionally, a series of 61 comic books (published by Gold Key) and featuring stunningly beautiful covers and interior artwork would be released starting in 1967 while the first-ever Star Trek novel would see release in 1968. Entitled Mission to Horatius, the children’s novel was written by Mack Reynolds and was published in hardcover format by Whitman Books. Whitman did not release any further Star Trek novels (that would be done by publishers like Bantam Books, with author James Blish writing the majority of the books), though they did go onto release several coloring and activity books. With the 1970’s, came a flood of merchandise – the majority of it courtesy of Mego Corporation and Azrak-Hamway International, Inc (AHI). Mego - whose line of action figures would dominate the toy industry for years was founded in the 1950s as a maker of cheap dime store toys. In 1971, the company began to acquire the exclusive rights to comic books characters, popular movies and TV shows of the day. Rising to fame the following year with their “World's Greatest Super Heroes!” line of 8 inch DC and Marvel comic heroes figures, Mego began to offer toys based on various science-fiction film and television properties such as Planet of the Apes and Star Trek. Kirk,Spock and McCoy Command Team Jigsaw BBC TV, 1972. As collectors of Mego toys can attest, the company created one of their finest toy lines with their Star Trek collection. 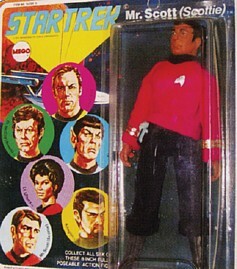 Released in 1974, the line’s first original five figures included Kirk, Mr. Spock, Dr. McCoy, Mr. Scott and the Klingon. A sixth figure - Lt. Uhura was subsequently added to the series and artwork on the figures’ cards were modified to add her image. Sporting highly detailed head sculpts, bright and colorful cloth costumes and accessories such as tricorders, utility belts, phasers and communicators, Mego used generic bodies along with interchangeable heads. This could result in the creation of different figures by merely by changing the heads and costumes, and would ensure costs were kept to a minimum. Despite the frugal production methods, the figures looked stunning and their strong sales resulted in several playsets and accessories being produced including U.S.S. Enterprise and Mission to Gamma VI playsets. 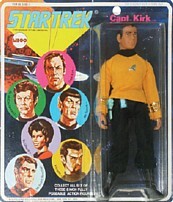 Captain Kirk action figure, 1975. The Enterprise bridge playset – which included a Transporter function to make figures “disappear” and “reappear” again as well as a Captain’s chair and a viewing screen displayed very little likeness to the look of the bridge on the television show. Despite that, kids loved it and it was an interesting plaything as it could fold back up and double as a carry case (complete with handle) to house and transport the figures. Produced in large quantities, the Enterprise set is easily found nowadays, though many seem to be without their cardboard boxes. The Mission to Gamma VI playset was an impressive looking toy that featured an ancient Inca or Aztec-like temple complete with large green idol with movable jaws and eyes that glowed in the dark. A number of small alien monsters (that could be used to menace the Starfleet crew) were also included with the set. Mego also released striking looking Communicator walkie-talkies (capable of transmitting up to 1/4 mile) in 1974 and went onto release further accessories such as a Super Phaser II Target Game and a Command Communications Console (a CB-like device that was able to send and receives messages) in 1976. But it is two further lines of figures that were produced of the shows “Aliens” that are particular interest to collectors. Consisting of a Gorn, Neptunian, Cheron, Keeper, Andorian, Romulan, Mugato and Talosian, they are extremely difficult to find and their scarceness have led collectors to pay sums of up to several hundred dollars a piece or better for original mint, carded specimens. 30th Anniversary Barbie and Ken Set, 1996. When Star Trek’s first feature film, Star Trek: The Motion Picture came to movie screens in 1979, Mego released figures took their cue from Kenner’s hugely popular Star Wars figure line and only produced their figures in only 3 ¾ inch and 12 inch scale sizes. Smaller scale figure offerings consisted of Kirk, Spock, McCoy, Scotty and two new additions to the film -- Captain Decker and the attractively bald headed Ilia as well as aliens like the Klingon, Acturian and ultra-rare Megarite, Rigellian, Zaranite and Betelgeusian. The larger figures were contained to the crew (minus McCoy and Scotty) as well as Klingon and Acturian figures. Azrak-Hamway International, Inc, or AHI also produced several popular and in many ways, offbeat Star Trek toys. Founded in 1964 and specialized in “rack toys”, the company’s offerings mainly consisted of items such as a parachuting figure of Mr. Spock as well as a U.S.S. Enterprise (complete with helicopter blade!) that could be whisked into the sky via a launcher. Packaged on flimsy bubble cards, the toys are fondly remembered and are now very rare to come across nowadays – as their cheaper quality resulted in many of them being easily broken and thrown into the trash soon afterwards. Mr. Scott (Scottie) Action Figure, 1975. Other memorable ’70’s collectibles include a number of Book and Record sets released by Peter Pan/Power Records in 1975; several View-Master reels sets (released by GAF) including one for the original TV series, one for the 1973 Filmation-produced Star Trek The Animated Series, entitled, Mr. Spock's Time Trek and one for Star Trek: The Motion Picture; a set of beautiful designed drinking glasses (courtesy of Dr. Pepper) as well as various puzzles and activity books released by Whitman and Milton Bradley from the mid to late ’70’s. These items are now fondly remembered, provided countless hours of joy to those children lucky enough to have owned them. With a plethora of new Star Trek toys and collectibles hitting the market as a result of the new motion picture, here’s hoping the Trekkers and Trekkies of tomorrow enjoy their toys as much as we did (and still continue to do). James Burrell is a Toronto-based writer whose work has appeared in numerous Canadian publications including the award winning Rue Morgue. He is also an avid collector who has been acquiring vintage science-fiction, superhero and monster toys and movie collectibles for twenty five years.